We leave two weeks from today for our next trip. Brian has been at his job for a bit over a year now and has received his ten-day allotment of days off. He hasn’t been on “vacation” (though we call our travels trips, not vacation) since our Great Ten Year Anniversary Trip in June of 2007. I’ve since been to Paris and on the motorcycle trip with my dad, not to mention work trips to California, Oregon, Las Vegas and NYC. I’m sure Brian is ready to get away. We chose Canada when we finally accepted that the euro was at a buck sixty to stay, making Europe too cost-prohibitive. (Of course over the past few weeks we’ve watched it slide back down below $1.30 and are plotting to go back next year.) We both like cold, snowy weather, and they do speak French in Quebec, so it seems like a good choice. But I know it will be fun — the food will be good, hopefully we’ll have snow, and I have some fun blogging assignments. 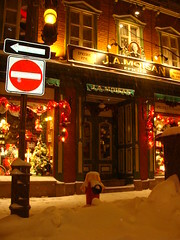 I’m writing a series for Jaunted on “Eating your way through Quebec,” which will also include a video. We’re staying free with points in Montreal so we splurged a bit in Quebec City on a boutique hotel — Hotel Dominion 1912. I may not be giddy with excitement, but I am dreaming of hot chocolate in front of a fireplace on a snowy night.